Japanese cuisine is still a bit of a mystery to me. In my imagining of what Japanese food I always think of few ingredients, simple presentation, clean flavors and of course seafood. This is, I am sure, an oversimplification of a diverse cuisine. Recently I found myself at home with a free night. The kids and wife were away with the in-laws and I was free to try something that might or might not be up their alley. It also needed to be quick because I had a lot of chores to get through. 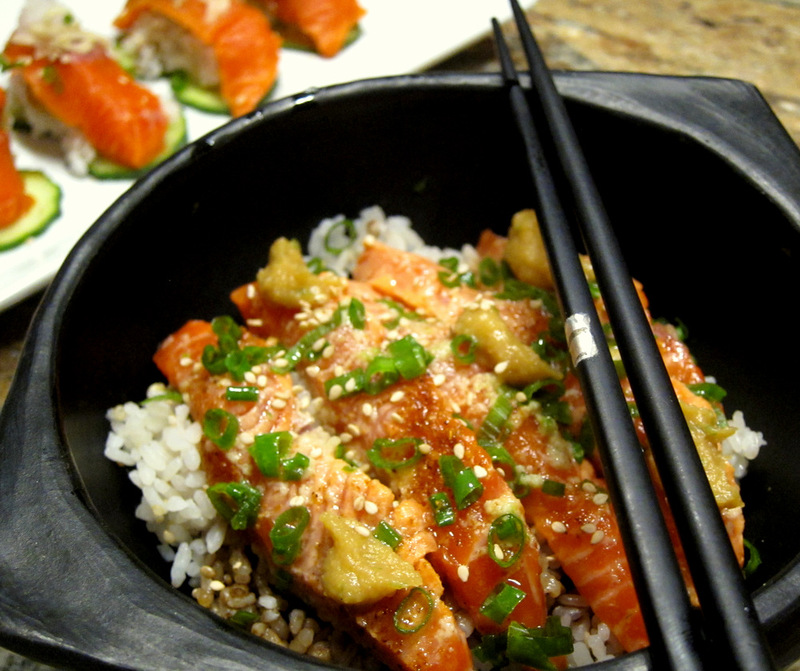 That’s how I ended up playing around with some Japanese inspired flavors using pristine salmon, miso and sushi rice. Elizabeth Andoh’s book Washoku is one of a few Japanese cookbooks I own but is one I reach for often for inspiration or a quick recipe. I love her approach and the recipe usually deliver wonderful dishes. I knew that I will be making rice for my meal of course and her recipe for “Rice with Mixed Grains” is a terrific method for preparing it. I washed the sushi rice until the water ran clear and then mixed it with a few tablespoons of the grains (I used buckwheat, sesame and some flax seeds). Andoh’s method for cooking the rice is very detailed and relies a lot on the sounds of the covered pot more than anything. That strikes me as very romantic and…Japanese. The end result is a perfectly cooked bowl of rice. I kept some of it warm and slightly cooled some of it for my sushi plate. The slightly cooled rice was mixed with a little Mirin and rice wine vinegar. I love the flavor of miso and have used it in marinades and sauces. The sharp savory salty flavor works so well with all foods, from meats to vegetables. I borrowed another recipe from Andoh’s book for a citrus miso. This is just white miso flavored with citrus zest and juice (lime and lemon) and cooked with sake to a delicious thick sauce. Slicing the fish for sushi is where practice -or lack of it- really shows. 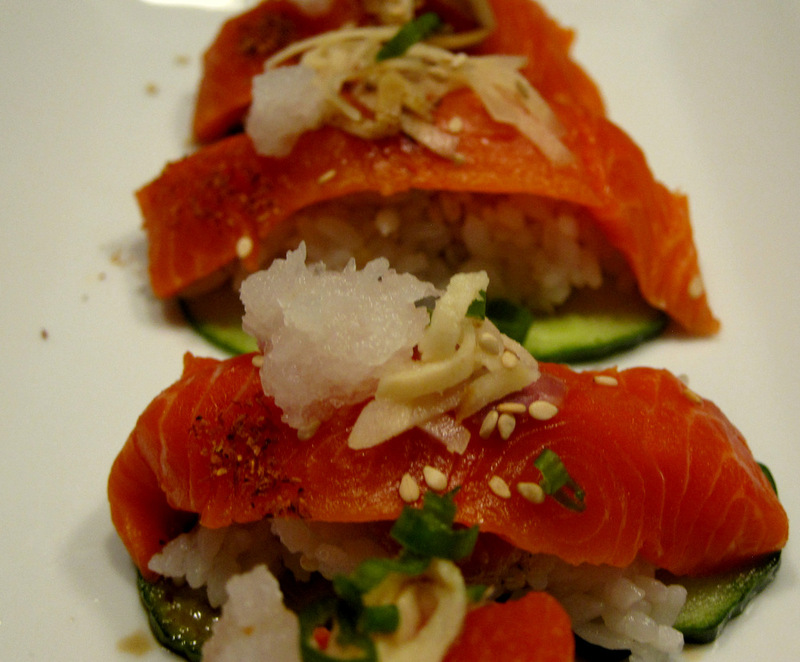 Sushi masters practice years to be considered proper sushi chefs worthy of slicing fish properly. If you have not seen Jiro Dreams of Sushi, stop reading right now and go check it out and you’ll see what I mean by perfection in making sushi. My fish slices were fine but lacked that proper angle and finesse that good sushi has. The flavor of those bites was fantastic though. I formed the rice into small mounds and dotted it with a bit of the miso sauce. 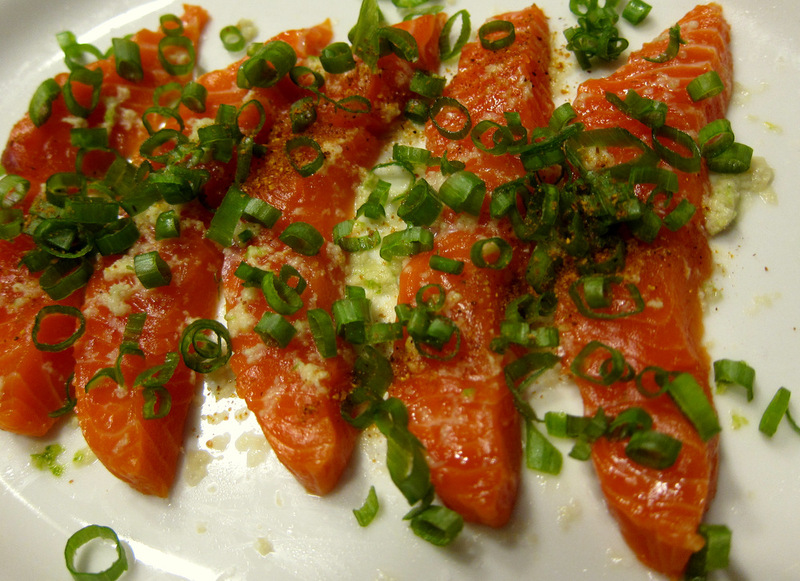 The salmon went on top and got a garnish of grated daikon radish, finely sliced pickled ginger, sesame seeds and a pinch of hot pepper powder. 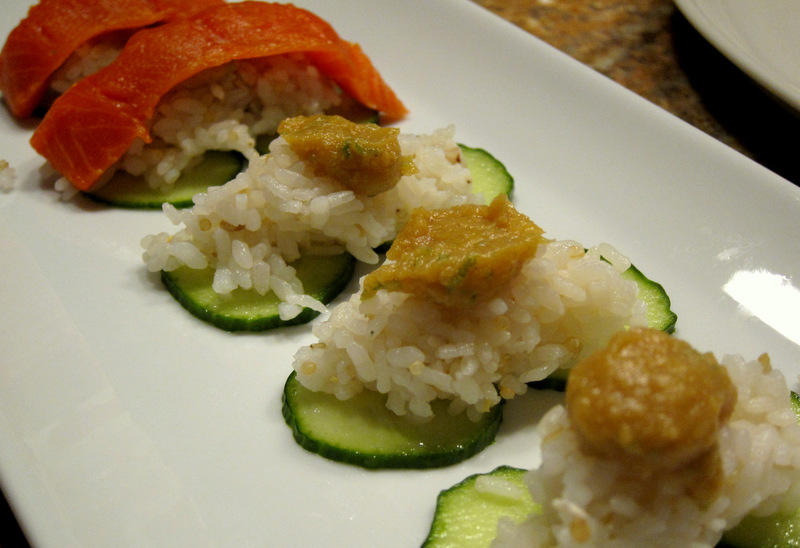 I plated the sushi on top of thin cucumber slices to add another texture. This dish was excellent with the perfect textures and lovely fresh balanced flavors ranging from nutty to salty and savory with a hint of sweetness. Chef Nobuyuki Matsuhisa of the Nobu restaurant empire is probably one of the best known modern Japanese chefs. He does “fusion” well where the flavors of Japan mix with those of South America in a combination of classical and modern preparations. He was the first person I’ve seen pouring boiling hot oil over pieces of fish in order to barely cook them. He calls the oil “New Oil” in his book Nobu Now. It’s something he said he came up with to appeal to those squeamish about eating raw sashimi. So, I gave that a shot. 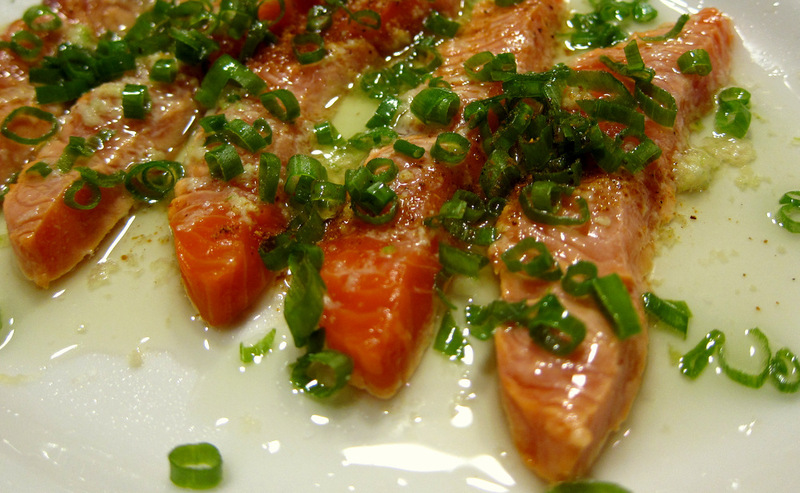 I placed the sliced salmon on a plate and topped it with grated ginger and shopped scallions. Then I heated a few tablespoons of oil till smoking and drizzled that all over the fish. 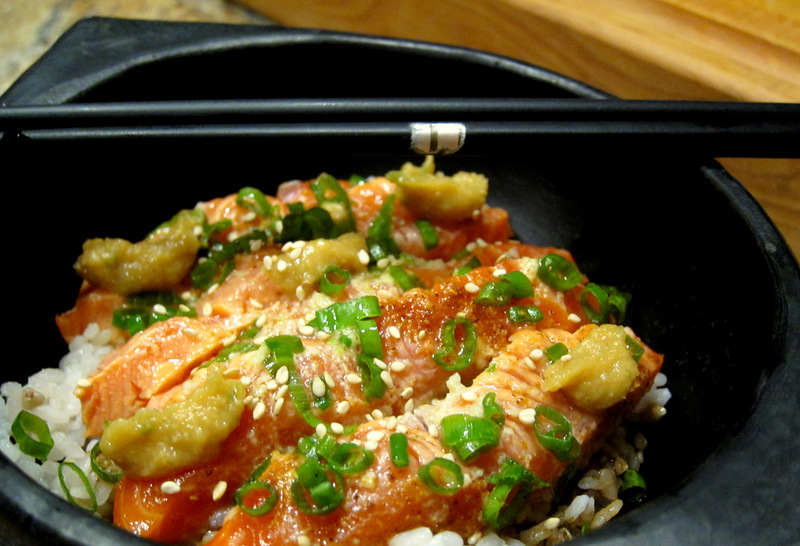 I plated the fish on top of the rice in a bowl and served it with a few small spoons of the citrus miso sauce. The barely cooked fish had a nice texture and was gently warmed. 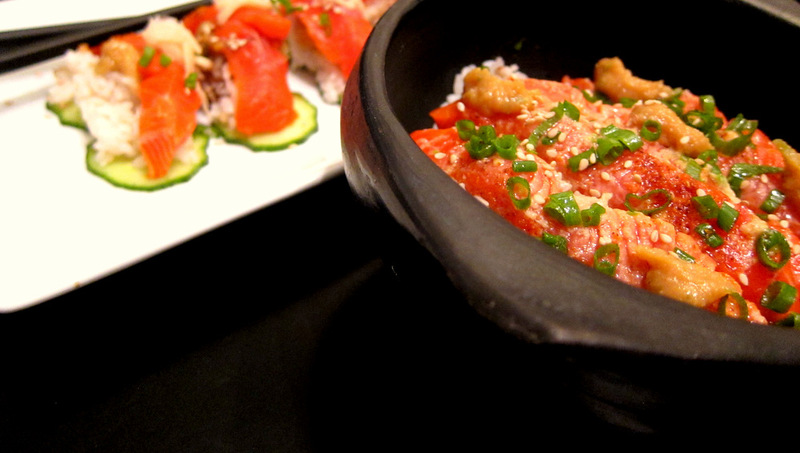 It worked perfectly with the nutty rice and sharp sauce. It’s definitely a technique and dish that is easy to prepare and I will be exploring some more in different variations.